The US' dangerous muscle-flexing in Asia-Pacific is a continuation of Obama's "pivot to Asia" strategy, US peace activist Jan R. Weinberg told Sputnik. To avoid yet another missile crisis all the parties involved need to start negotiations over the long-term disarmament and eradication of nuclear weapons in the region, he stressed. In his March interview with Sputnik the founder of "Show Up! America," Jan R. Weinberg, warned that the US-led militarization of the Asia-Pacific region might turn into the "American Missile Crisis." "The American Missile Crisis may very well become the term that historians use to describe the precipitously dangerous, present day, militarization and terrorism issues within the Indo-Asia-Pacific region," he warned. 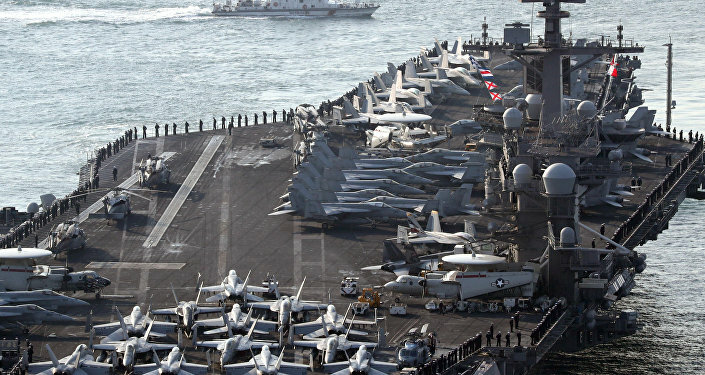 Less than in a month since Weinberg's warning the situation over the Korean Peninsula nearly spiraled out of control, following Washington's show of force. It has even prompted some observers to draw parallels between the current state of affairs in the region and the Cuban Missile Crisis of 1962. Is the Trump administration deliberately aggravating the situation in the region? What goal are they pursuing? According to Weinberg, US President Donald Trump is "simply working off of the playbook that the Pentagon handed off to him." "Make no mistake, the little that we have gleaned regarding Trump's foreign policies stands precipitously on the shoulders of the militarization aspects of the Obama administration's 'pivot to Asia' foreign policies. Trump's final blow in eradicating the Trans-Pacific Partnership (TPP), which was indeed a cornerstone aspect of the 'pivot,' has certainly not dispersed Obama's predilection for the forward deployment of US military assets, sales or gifts of major armament systems and enhanced military to military exercises," the American peace activist told Sputnik. "From the point of view of the US-based armament industry defense contractors, who work hand-in-hand with just about all levels of State and Federal Governments, their goals remain the same, throughout each presidency; for the sake of profit — to sell their products. They know full well, as I succinctly stated in my exposé, 'Violence, Incorporated', that 'Fear is the Product Placement of the Armament Industry'," he added. Weinberg called attention to the fact that as of yet there has been no indication that Trump has veered from Barack Obama's "pivot to Asia" strategy. "For example, the Terminal High Altitude Area Defense (THAAD), manufactured by Lockheed Martin, has recently been deployed to South Korea, regardless of the admonitions of both the Chinese government and the citizens of South Korea," he noted. "However, in this instance of government/corporate collusion the results have created a sustained depth of fear throughout the entire Indo-Asia-Pacific region, which I have previously described as the 'American Missile Crisis'," the peace activist said. Former Reagan-era US official Paul Craig Roberts suggested in his recent op-ed that the North Korean 'crisis' is a Washington orchestration, reminding his readers that regardless of its image of a troublemaker in the Western press North Korea has not attacked or invaded anyone in the last 64 years. "Mr. Roberts in his article 'What the N. Korean 'Crisis' Is Really About' succinctly states: 'So what is the demonization of North Korea by the ‘presstitutes' and Trump administration about?' I couldn't agree more, however, it is not fair to lay this solely at Trump's feet being that each of the militarized magnifications throughout the Indo-Asia-Pacific are part of a continuum that ran through the Obama administration, having manifest itself as the 'pivot to Asia'," Weinberg responded, "Time will tell which ridiculous title Trump ascribes to it." An F/A-18E Super Hornet lands on the flight deck of the U.S. Navy aircraft carrier USS Carl Vinson as the Ticonderoga-class guided-missile cruiser USS Lake Champlain (L) and the Arleigh Burke-class guided-missile destroyer USS Wayne E. Meyer transit the western Pacific Ocean May 3, 2017. "To add to the embarrassment, media outlets and many institutions of higher education in many instance have a vested interest, at varying degrees, to not displease their corporate owners, benefactors, advertisers, or government officials — therefore it take quite the educated reader to 'see through' or functionally critique the generated news articles or public pronouncements," Weinberg highlighted. "Therein lies the problem — just how does one become an erudite reader of the news if they are not at first presented with open, honest, detailed and verifiable source materials?" he asked rhetorically. Meanwhile, a glimpse of hope emerged in the East with Moon Jae-in's rise to power in South Korea. Experts say that Moon Jae-in's win offers new opportunities for the peninsula, especially given his pledge to resume the six-party talks on Pyongyang's nuclear program. Newly elected South Korean President Moon Jae-in takes an oath during his inauguration ceremony at the National Assembly in Seoul, South Korea, May 10, 2017. In his op-ed for RIA Novosti Russian journalist and political commentator Dmitry Kosyrev emphasized that the newly elected president is likely to push ahead with the rapprochement between Seoul and Pyongyang within the framework of the so-called "Sunshine Policy." For her part, speaking to Sputnik, peace activist Helen Caldicott expressed her confidence that the election of Moon offers hope that the THAAD system will be withdrawn from the country. Will Moon manage to reduce tensions in the region or will he eventually become yet another pawn in the US power game in the region? "Only time will tell if the business interests between China and the United States, China and North Korea, and the United States and South Korea will ultimately prevail over the self-serving and destructive interest of the pervasive defense/armament industry — which as it so happened has an established commercial presence in South Korea," Weinberg responded. "Let us support Moon Jae-in, the newly elected president of South Korea, in his peace and reconciliation initiatives, when he professes — 'I am willing to go anywhere for the peace of the Korean Peninsula. If needed, I will fly immediately to Washington. I will go to Beijing and I will go to Tokyo. If the conditions shape up, I will go to Pyongyang.' However, if the related militaries do not stand down, pull back and the associated governments do not negotiate long-term disarmament including a precise plan for the eradication of nuclear weapons then I am sad to say — all will be lost," the American peace activist stressed.